Harford Mayor Luke Bronin and Gov. Dannel P. Malloy. Hartford Mayor Luke Bronin ended his exploratory campaign for governor Monday, a concession to the inherent conflicts facing a Democrat advocating at the State Capitol for a city in desperate need of state assistance while also pursuing a personal agenda of political advancement. 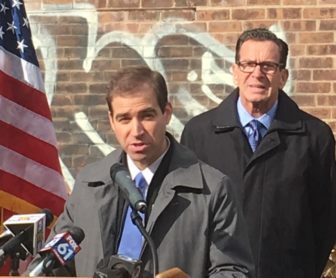 Bronin, 38, a former top legal adviser to Gov. Dannel P. Malloy, had no obvious path to victory in a crowded Democratic field. He was hobbled by suburban animus to Hartford, hostility from public-sector unions influential in Democratic primaries, an association with Malloy and a pledge Bronin made in 2015 not to seek higher office in his first term at city hall. His biggest victory on behalf of a city facing bankruptcy when he took office on New Year’s Day in 2016 — the state assumption of payments on more than $500 million of the city’s debt over the coming decades — quickly became a tremendous liability for a candidate seeking votes from taxpayers less than enthused about paying Hartford’s bills. Malloy said the assistance to Hartford clearly was allowed under the terms of legislation passed last year creating a Municipal Accountability Review Board. But legislators say they were stunned that the board was empowered to offer more than short-term financial help in return for the ability to conduct oversight. Bronin, who was the last of the major Democratic gubernatorial contenders with an exploratory campaign, announced his decision in a statement released on the same day he sent his proposed budget for the coming year to the review board. By the end of March, Bronin had raised $228,927 and spent $115,407 through an exploratory campaign committee. But his failure to formally declare his candidacy once April began betrayed an uncertainty about the ability to go forward. The two-day Democratic nominating convention opens May 18. Hartford will send 78 delegates to the convention, third behind New Haven and Bridgeport. Qualifying for a primary requires support from 15 percent, or 300, of the 1,998 delegates. But he was tempted by a wide-open race — as were others. Since opening his exploratory campaign, former Secretary of the State Susan Bysiewicz and Ned Lamont, the winner of the 2006 primary for U.S. Senate, have jumped into the race for the Democratic nomination. Bridgeport Mayor Joseph P. Ganim, who was elected the same night as Bronin, also is in the race. Also competing are: Jonathan Harris, a former state senator from West Hartford who also served as executive director of the Democratic Party and consumer protection commissioner under Malloy; Sean Connolly, the former veterans affairs commissioner; and Guy Smith IV, a first-time candidate who recently announced he is bypassing the convention to petition for a spot on the primary ballot. “Now, I think the fields are set on both sides,” said Roy Occhiogrosso, a Democratic political consultant. Vinnie Mauro, the Democratic chairman of New Haven, said Bronin’s departure sets off a scramble for his supporters, without making anyone the clear frontrunner. “I don’t think it’s any more clear today than it was before his announcement,” he said. Lamont recently won a Connecticut AFL-CIO straw poll at the labor federation’s political convention. Bronin, who declined to fill out an online survey that required yes or no answers to questions about supporting three dozen issues, was not invited to the convention.